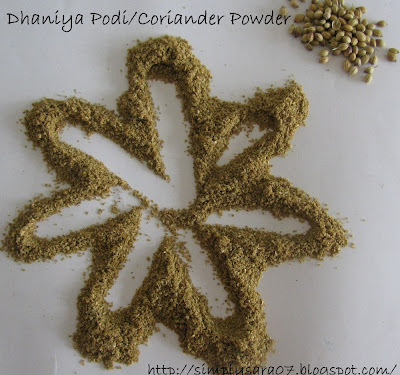 Dhaniya Podi (Coriander Powder) is very simple and used for many dishes in our kitchen. Here I bring you a very easy recipe of it. Take required quantity of Dhaniya(Kothamalli Verai/Coriander seeds) and slightly roast it in a kadai without oil in medium heat. You can also keep it under sun. Allow it to cool and grind in mixie to a fine powder. This is very flavourful.. This podi/powder can be stored in air tight container and stored. Send in your entries for Say Cheese Event if you have not sent just 2 days left. thanks for the easy homemade recipe. Nothing will replace the homemade spice powder, i cant cook without dhaniya podi..looks prefect! Looks perfect and loved the presentation!! perfect dhaniy podi and nice rangoli of the dhaniya podi.